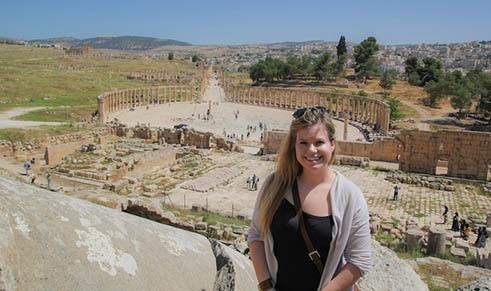 Travel north to Jerash, one of the best preserved roman outposts in the world. Stroll the street of columns to the oval plaza and linger till sunset when the city is awash in golden light. From there, follow an archaeologist’s dream to other ancient cities and towns: 9,000 year old Pella, the hill top ruins of Gadara, or Um Qais, and Um el Jimal, “Black Gem of the Desert.” Only a short hour’s drive north of Amman is the Greco Roman City of Jerash (Gerasa in ancient times), known as the Pompeii of the East for its extraordinary state of preservation. As they approach the city, visitors are greeted by the imposing triple arched gateway built to honor the emperor Hadrian’s arrival at Jerash in A.D. 129. Jerash is considered the best preserved and most complete city of the Decapolis, a confederation of ten Roman cities dating from the 1st Century B.C. Nestled in a green and well-watered valley in the biblical land of Gilead, the remains of the ancient city have long attracted tourists, scholars and students from all over the world. Today’s visitors may wander among the original temples, theaters, plazas, bathes and colonnaded streets; all enclosed within the remaining city walls. Within these walls have been found the remains of settlements dating from the Bronze Age, the Iron Age, the Hellenistic, Roman, Byzantine, Umayade and Abbasid periods, indicating human occupation at this location for more than 2,500 years. Nightly sound and light shows through the summer months, and the annual Jerash Festival of Culture and Arts held each July, bring the ancient community to live for today’s visitor.